Panang Curry with Shrimp and Squid. Thai Paradise Restaurant. Thai Paradise Restaurant. 3551 Camino Mira Costa, Suite B, San Clemente. 949.489.9914. There are few things that warm the body and soul like curry. Its components appeal to all senses and offer a little indulgence of salt and cream, while spice from chilies either mixed in or added heat the body from within. 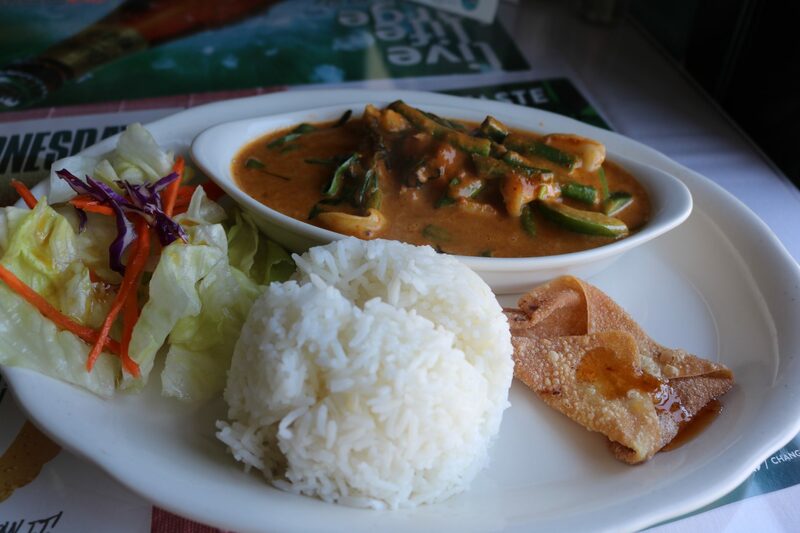 The Panang curry at Thai Paradise hits all the right notes. The peanuts in the red curry are familiar and inviting, while ground lemongrass and lime leaves bring citrus and herbs. Coconut milk is rich and slightly sweet, while chunks of green beans and green bell pepper provide crunch. The shrimp is cooked to perfection—fresh and snappy—while the squid comes in long filets that soak up the flavor of the curry while offer mild brininess. And the heat built into the curry is the kind that starts somewhere deep in the stomach and doesn’t overwhelm. The curry comes alongside pillow-soft rice, a crispy wonton and a small and crisp ginger-dressed salad. All in all, it’s an exceptional lunch combo.